National Cocoa Shell can deliver this premium environmentally friendly cocoa shell to you for your club or retail outlets. 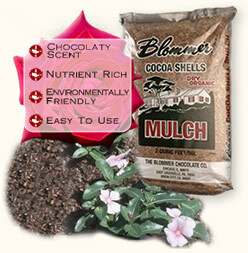 Please contact us to find out more about National Cocoa Shell and the great benefits of cocoa shell mulch. "One of the most ignition resistant of the organic mulches was cocoa shells. Cocoa shells were statistically more fire resistant... than decorative ground rubber, pine needles, oat straw, shredded hardwood bark, and shredded cypress bark..." Read the full report. Wednesday August 18th at 9p.m. Thursday August 19th at 1a.m. Thursday August 19th at 6p.m. Saturday August 21st at 11:30p.m.